We are two minutes’ walk from Waterloo, Waterloo East and Southwark Stations. The easiest way to get to The Old Vic is via public transport. to improve access to our building and double the ladies’ loos. This work will take place until September 2019. 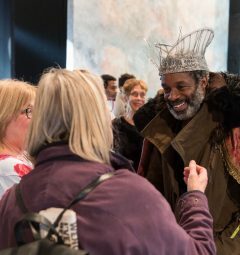 Please bear with us during this time – we are trying our best to make sure you still enjoy your visit to The Old Vic. if you received an e-ticket, you don’t need to print this – just show us your e-ticket on your smartphone and it will be scanned. for your comfort and security, you may have your bag checked. We appreciate your patience and understanding while these are taking place. You need to have your tickets with you, downloaded to your phone. You will need your ticket to get into the auditorium and to get up to the Dress Circle (level 1) and Baylis Circle (level 2) if that is where you are seated. If you lose your ticket, our Box Office staff can help. the front entrance on The Cut; a temporary entrance on Waterloo Road; a temporary entrance on Webber Street. you will not enter the auditorium through the front theatre doors on The Cut. Instead, if you are sat in Stalls left (Seat numbers 1–20), you will enter/exit via Webber Street and if you are sat in Stalls right (Seat numbers 21–36) you will enter/exit on Waterloo Road. There will be extra Front of House staff and signage to help you find your seat. If you need to collect your tickets from the Box Office, this will still be situated in the foyer accessible from The Cut. SAT IN THE DRESS OR BAYLIS CIRCLES? you will enter/exit the auditorium through the front theatre doors on The Cut. You will access your seats via the main staircase and through the usual auditorium doors. Please note that although you can enter the auditorium in the normal way, toilet facilities will be located outside on Webber Street. the ladies’ loos are your number one complaint so we are now working to double this provision to serve you better. This does however mean that the existing toilets in the basement and on the top floor are out of action while we renovate them. Instead, we will have temporary toilets situated on Webber Street. There are three blocks of toilets for women with seven toilets in each (twice as many toilets available as there was previously). These will be clean, warm and secure. We know having to go outside isn’t ideal but there is a covered walkway to ensure you don’t get wet if it rains – and some umbrellas just in case. our basement bar, Penny, has moved to the 1st floor during the refurbishment. There will be mobile drink sellers in the Stalls area of the theatre. If you are sat in the Stalls we advise that you purchase your drinks once you are inside the auditorium as open drinks cannot be taken outside. have moved to the 1st floor during the refurbishment. It is open throughout the day serving drinks, sandwiches and snacks. There will be a pop-up bar in the temporary foyer and you can still visit the Baylis Bar on the Dress and Baylis Circle levels prior to entering the auditorium. We also have a limited selection of drinks for sale in the Stalls area of the theatre. Pre-show service is from 6pm and anyone with a ticket can order a pre-show or interval drink (only those over 18 can purchase alcohol). From Monday–Wednesday Penny is open post-show until 1am and until 2am from Thursday–Saturday. At this point the bar operates as a public bar (you don’t need a ticket) and anyone under the age of 18 won’t be admitted. is available in the temporary foyer but we advise audience members to travel as light as possible. You can check small items for a cost of £1 per item. We cannot hold large bags in the cloakroom or admit them into the auditorium. You can take coats and small items into the auditorium with you. will be in operation for all audience members. Please note that bags larger than a rucksack are not admitted into the building. during the building project are unable to offer any hot pre-show meals but have a selection of cold sandwiches and snacks on offer in Penny on the 1st floor. There are many bars and restaurants in walking distance of The Old Vic. Get 10% off your food bill when you show your Old Vic ticket at Crust Bros – Neapolitan Pizza Masters just 30 seconds from The Old Vic or Honest Burger, Waterloo on The Cut. 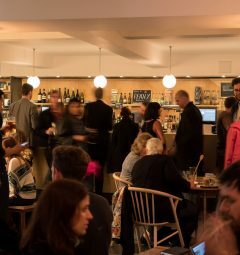 Baltic restaurant offers a pre-theatre and post-theatre menu at £18.50 for 2 courses for Old Vic customers (last orders at 10.45pm) – less than five minutes walk from The Old Vic on the corner of The Cut. Pre-theatre dining: a menu of bold, modern cuisine in beautifully-designed, theatrical surroundings. Post-show: a new late-night space for lounging after shows , a music-lover’s paradise. On the menu you’ll find dinner until late and cocktails/toasties until 2am. Saturday matinee: enjoy a pre-matinee brunch choose from a set breakfast/brunch menu that includes coffee and a juice. Get price band A tickets to see The American Clock, plus a pre-show 2-course meal at The Delaunay for £65 per person (valid on all evening performances 15 Feb–30 Mar) – use promo code DELAUNAYCLOCK when booking tickets online. Subject to availability. Get a VIP ticket for All My Sons plus a pre-show 2-course meal at The Delaunay for £147.50 per person (valid on all evening performances 24 Apr–7 Jun) – use promo code DELAUNAYMILLER when booking tickets online. Subject to availability. most shows, but not all, will have a late-comers point. These are appropriate moments in the show (usually during a scene change) when a member of staff will quickly and quietly take you to your seat. which usually lasts 20 minutes and takes place approximately halfway through the show. This is your chance to get a drink or go to the loo. You need to take your ticket with you for security reasons so you can get back in to the theatre. Staff will put a call out when it is time for the show to start again, so you won’t miss anything. in the auditorium but all drinks must be in non-glass cups or bottles. You can also take sweets and chocolate into the show with you but we ask for these items to be as quiet as possible (no wrappings) so that everyone can hear the action on stage. You cannot take hot food in with you. before the show starts so that you can still access your e-ticket as required. Photos and filming are not allowed in the auditorium. We advise that you turn your phone to airplane mode (rather than switching it to silent) to make sure everyone’s experience is as enjoyable as possible. with you at all times, as ushers will ask you to show your ticket when entering and re-entering the auditorium. whatever makes you feel comfortable. There is no dress code and formal dress is not expected. are not permitted in the auditorium, unless specified in the age guidance.